The Atlanta Community Food Bank (ACFB) is a WiSys customer and Exact Macola user that procures over 50 million pounds of donated food and groceries each year and distributes it to more than 600 nonprofit partner agencies serving families and individuals in 29 metro Atlanta and north Georgia counties. Through the partner agencies, they are able to serve around 80,600 people each week. To procure and distribute the donated food and groceries, ACFB utilizes more than 1,000 volunteers, 100 staff members, a fleet of trucks and a 129,000 square-foot facility. Their donors include manufacturers, wholesalers, retailers, brokers, restaurants, food drives, gardens and individuals. Partner agencies can then place orders online and arrange for pick up or delivery. Once the food arrives at the agency, it is provided to families and individuals in need. 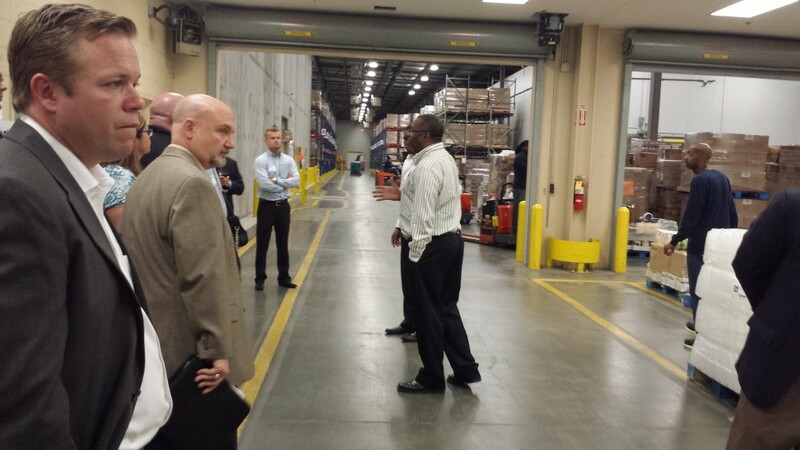 We recently visited ACFB as part of the APICS Atlanta Chapter April meeting. During the meeting, we toured their facility and heard from their Operations Manager about how they use WiSys to manage their supply chain. 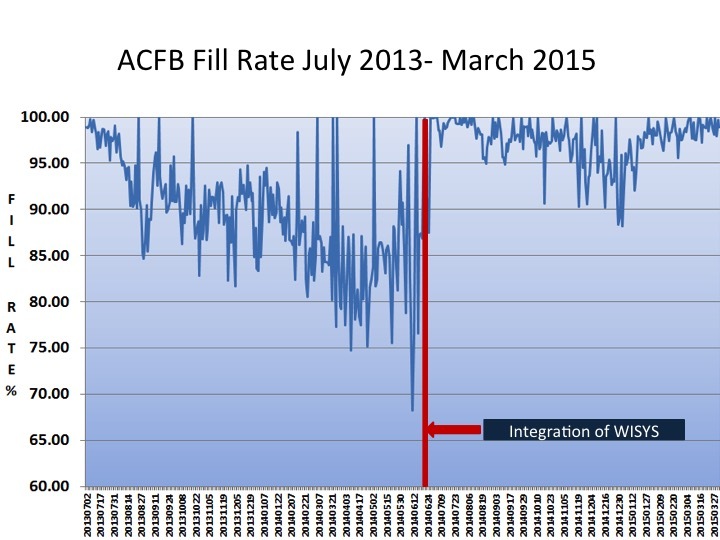 One of the major improvements the ACFM saw after implementing WiSys was their fill rate. In the chart below, you can see how their fill rate dramatically improved immediately after WiSys was installed. With WiSys, they were able to better manage their inventory and accurately fill orders from their partner agencies. A better fill rate means that enough food is being sent to partners to provide for families in need. And that means there are less hungry people tonight. 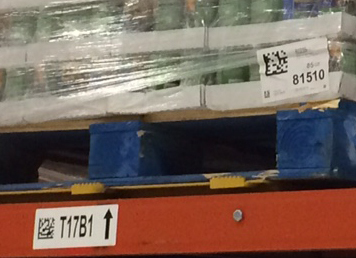 We were also impressed to see how the ACFB prints their labels and barcodes. They use a Labelmatrix 2D barcode font, which takes little space to represent characters and can be scanned from a greater distance. They also put a big and a small barcode on their label so that both a short and long range scanner can be used. We are thankful that organizations like the Atlanta Community Food Bank exist and are so happy that WiSys is able to help them improve operations and feed more people. To show our support, we started a fundraising drive and will match donations made to ACFB up to $10,000! Please visit the WiSys Supports ACFB fundraising page to make a donation! Because of the Food Bank’s ability to procure donated food and its efficient distribution model, a gift made here provides more food than through a traditional food drive, doubling or even tripling the amount of food your dollar can provide at the grocery store. Each dollar donated is leveraged to acquire and distribute $9.21 worth of donated grocery products. 94 cents of every dollar goes directly to fighting hunger. Each month more than 1,500 volunteers support the ACFB mission. They are a member of Feeding America, an association of 203 food banks across the U.S.